Yesterday I got a support ticket from a user that was complaining about her Lenovo T440s laptop turning off every time she unplug the power cord from the laptop. Indeed the laptop was shutting down when removing the power cord even though both batteries were showing fully charged. The first thing I did was to upgrade the BIOS and reinstall the power management driver, but that didn’t seem to have helped. After trying many tips and tricks I found on the Internet I figured the problem might have been the internal battery. 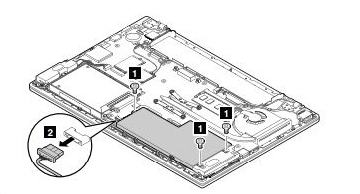 I removed the bottom cover off the laptop, and disconnected the internal battery pack connector from the motherboard. I put the cover back on and tested the the laptop by unplugging the power cord while the computer was on, and this time it didn’t shut down, so the problem seemed to have been the internal battery. We have many Lenovo laptops T430, T440, T4040s, T550, T550s and this is the first time someone complained about this problem, so I don’t think it is a manufacture defect on the device, it must have been something specific with this individual laptop. If you have this problem, and your laptop is still under warranty, the best thing to do is calling Lenovo for support. They will send you a new battery pack if they find that the internal battery is the problem. I didn’t’ call Lenovo, the user doesn’t even know the laptop has two batteries, so she was happy that I fixed the problem, and I was happy to get that monkey off my back!